When was the last time you had your gas boiler inspected or serviced? You could be saving a fortune on your central heating and hot water bills by installing a new gas combi-boiler, or by simple measures such as fitting thermostatic radiator valves. Having your boiler regularly serviced is essential to make sure it's working efficiently and safely - and, if you're a landlord, you must have all the gas appliances inspected by a Gas Safe plumber. Any Corrie fan - and anyone with any common sense - knows that it's essential to have your gas appliances installed and serviced regularly by a Gas Safe registered engineer. A badly installed or poorly maintained gas central heating boiler, gas fire or even a gas cooker can give off carbon monoxide gas that you can't smell or taste or see. You don't know they're there until you, your family or your tenants fall gravely ill - those fumes can kill. Call us now on 01709 204881 to have your gas appliances tested and certified safe. Get in touch with Combi Nation NW today. Call us on - 01709 204881. Text us on 07834 196 180 or send us an email - we'll be happy to quote you for any gas or plumbing work in South Yorkshire. 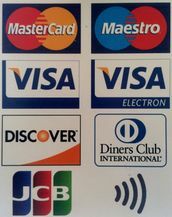 We now accept all major credit and debit cards!! !